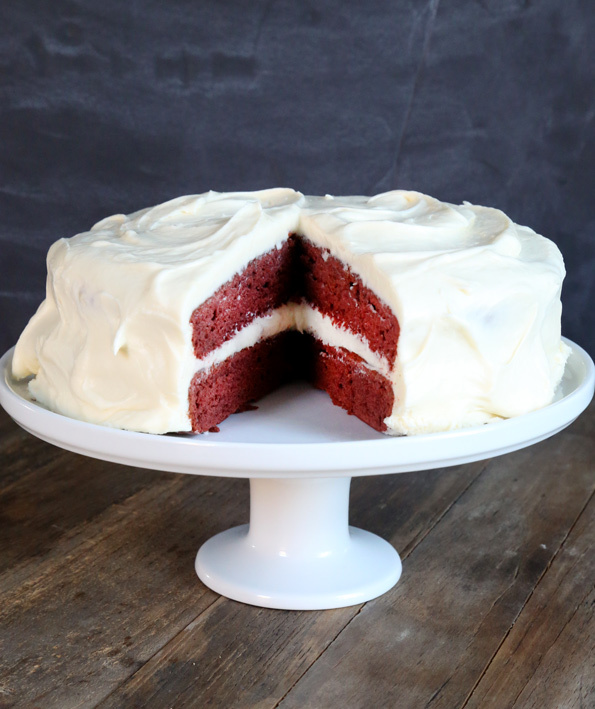 Classic Gluten Free Red Velvet Cake | Great gluten free recipes for every occasion. 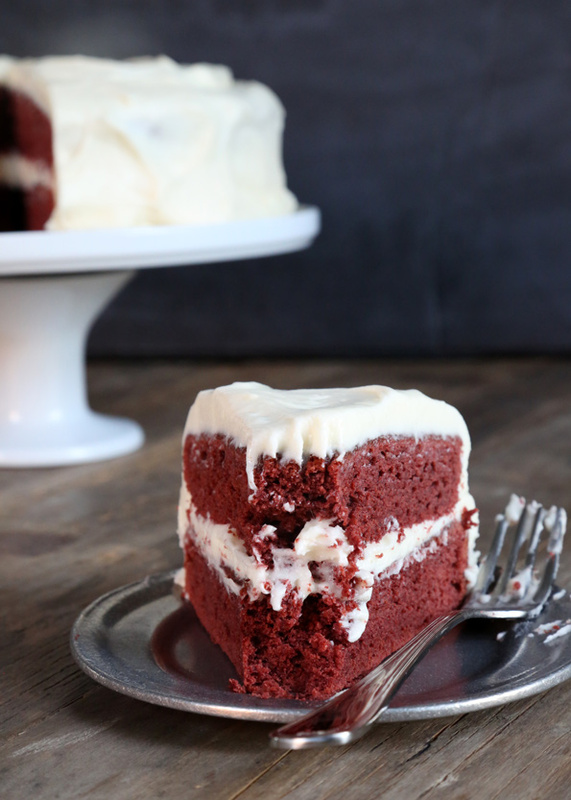 This classic gluten free red velvet cake is everything you remember red velvet to be. Moist and tender, lightly chocolate cake that is my go-to recipe whenever I want to please chocolate and non-chocolate lovers alike! Is it age that gives us an appreciation for chocolate? I never would have thought so, until I started serving cake to small children. But it seems, given the choice, little kids will always pick vanilla cake over chocolate. I have 3 children. Two of them love chocolate. The third, my gluten free son, simply isn’t a chocolate lover. With every birthday he celebrates, I expect the chocolate-lover in him to awake. So far, no go. So when I make his birthday cake, and I want it be something everyone loves, I go with red velvet. We’ve talked about red velvet here on the blog before, but even though I know I might upset some by using red food coloring,* I don’t really tire of it. Neither does my family. My kids love red velvet cake, and even though it’s really just moist chocolate cake with red food coloring, its real charm lies in its flavor. It’s not a deep chocolate cake. There’s no melted chocolate in the batter, and there isn’t even an overwhelming amount of cocoa powder. It’s just right, and tends to please chocolate cake lovers and vanilla cake lovers alike. *If you’re not comfortable using red food coloring, by all means just leave it out! I know that there are other recipes on the Internet that make red velvet cake with beet powder, but that changes the entire recipe and I honestly don’t think it’s worth the bother. It’s also not an overly sweet cake, which means that the cream cheese frosting is all the more important. Remember that cream cheese frosting is not a stiff buttercream, so it will stay softer and more spreadable even when you slice into the cake. Preheat your oven to 350°F. Grease two 9-inch round baking pans, and set them aside. * In a medium-size bowl, place the flour, xanthan gum, cornstarch, salt, baking powder, baking soda and cocoa powder, and whisk to combine well. Set the bowl aside. *You can of course use 8-inch round cake pans. You will need to increase the baking time slightly (by a few minutes, likely). You could also use 8-inch or 9-inch square pans, too. Or even make cupcakes! Make the cake batter. In the bowl of a stand mixer fitted with the paddle attachment (or a large bowl with a handheld mixer), beat the butter on medium-high speed until light and fluffy. Add the granulated sugar, followed by the eggs and vanilla, beating to combine well on medium-high speed after each addition. Add the vinegar and then about a scant 1/8 teaspoon of the food coloring, if using, and beat to combine very well. The mixture may look a bit curdled, and that’s fine. Add the dry ingredients, alternating with the milk, and beginning and ending with the dry ingredients, mixing to combine after each addition. The batter should be smooth and relatively thick. Bake the cakes. Divide the cake batter evenly between the two prepared pans, and smooth into an even layer with a wet spatula. Place both pans in the center of the preheated oven and bake, rotating once during baking, for 25 minutes, or until a toothpick inserted in the center of each cake comes out mostly clean, or with a few moist crumbs attached. If you are baking the cakes in 8-inch round cake pans, you may need to increase the baking time by a few minutes as your cakes are thicker. Remove from the oven and allow to cool in the pans for 10 minutes before inverting the cakes onto a wire rack to cool completely. While the cakes are cooling, make the frosting. In the clean bowl of a stand mixer or a clean large bowl with a hand mixer, beat the cream cheese and butter on medium-high speed until light and fluffy. Add the vanilla and salt, and beat to combine. Add about half of the confectioners’ sugar, and beat on medium-low speed until the sugar has been absorbed by the butter and cream cheese mixture. Add the rest of the confectioners’ sugar about 1 cup at a time, beating on medium speed to combine after each addition. Once all of the sugar has been absorbed into the mixture, increase the mixer speed to high and beat until light and fluffy. The frosting should hold its shape when scooped, but should not be completely stiff. To assemble the cake, place one of the cooled cakes upside down on a serving platter. Place about 1 1/4 cups of frosting on top and spread into an even layer. Invert the second cake place on top of the frosting and press gently to adhere. For the neatest frosted cake, cover the entire top and sides of the cake in a very thin layer of frosting (this is called the crumb coat), and place in the freezer until very firm (about 15 minutes). 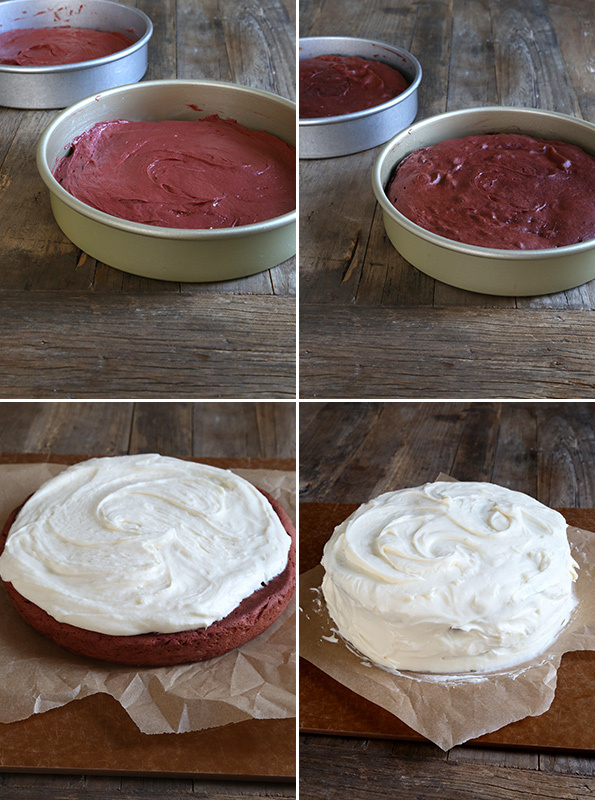 Remove the cake from the freezer and cover the top and sides with the remaining frosting, spreading into an even layer. Swirl the frosting around randomly with a butter knife or offset spatula. Refrigerate the frosted cake for at least 15 minutes before slicing with a sharp knife into generous slices, and serving. P.S. Do you have your copy of Gluten Free on a Shoestring Bakes Bread? With the holidays coming, there’s no better time for the true bible of the best gluten free bread baking! Deep-fried turkey is really good. Just saying…. This looks delicious! Have you ever thought about making pumpkin cream pie? Oh how I wish I can just be home baking! Yes, those words came out of my mouth! LOL! Nicole Hunn you have turned me into someone who will no longer bake for Thanksgiving and Christmas only! My future daughter-in-law (so we hope) loves red velvet cake! Now I have one I can make for all to enjoy! She has requested the Cheesecake Cookies because she wasn’t there when I made them last and wants to try them. So I have to make a batch to go home with my son because they’re going to be separate on Thanksgiving, along with their own apple pie. My daughter has given me permission to do a totally gluten free stuffing for Thanksgiving (I will combine Japanese Milk Bread and cornbread) because they are your bread recipes! I have a grain free person coming, so I cannot stuff the bird this year. I decided to do spinach and Italian sausage in the bird instead so she doesn’t feel left out. My family is into this one because that is a stuffing I usually stuff hens with it, so they’re getting a 2-for-1. You are an awesome hostess!!! Thank you, Donia! I bet you are too!